With the prospect of a major boat conversion project ahead--and the likelihood of more projects in the future--Heidi and I decided that it didn't make much sense to suffer through winters working in temporary shelters. After all, I intend to do most of the project work during the winter months, so a decent work space seems critical. I toyed much with the idea of leasing space somewhere locally, but eventually we decided that it made more sense to simply build something and put the money towards that. The proposed building: 30' wide by 40' long by 20' eave height; 3:12 or 4:12 roof pitch, engineered for applicable wind and snow loads. Building construction will be wood or steel on a concrete slab, and the building will be insulated and heated for year-round work. Large sliding doors or overhead/rollup door in one end wall, as wide and high as possible. To keep costs down to a minimum, I will avoid installing windows initially, other than perhaps some panels in the doors or some wall light-transferring panels in the steel building. Real windows can always be added later as budget allows. One of the manufacturers I contacted provided me with some CAD images of the proposed building--it looked nice, though pretty industrial. This page is mostly for my own reference as I move forward with the planning, but you may find it interesting. To date, my research has focused on pre-manufactured steel buildings, but I have to compare with wooden structures as well. The metal buildings aren't inexpensive, and certain aspects of the construction--site work, slab, etc---will be the same regardless of the type of structure built. Clear space and height are critical, however--no support columns are acceptable. This may work out in favor of the steel building, which is specifically engineered to satisfy this need. Increasingly worried about the cost involved in constructing this shed, I decided to do some basic design work so that I could better figure out some pricing for wood for the project, as an alternative to steel. I received some email to the effect that a wooden building incorporating a trussed roof structure might tend to be less expensive to construct than a similar steel building. In many ways, I prefer wood if at all possible, particularly since I could be more involved in the construction, saving even more money. My biggest concern is that the engineered roof trusses for a building of this width and requiring strength for a high snow load might be costly. Still, where it ends up when compared with a similarly-engineered steel building was anyone's guess. I had to move forward with some rough planning drawings of a wood structure to try to get a price. 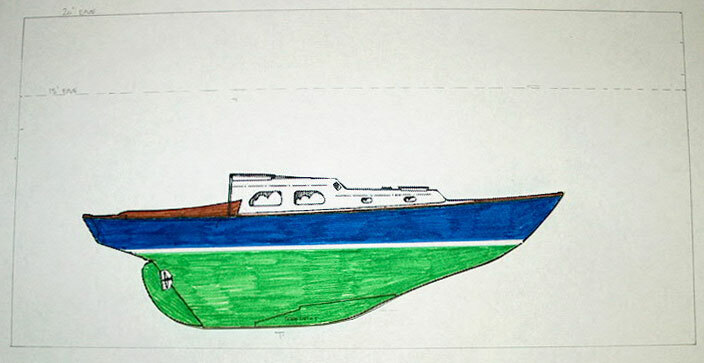 I decided it would be informative--not to mention kind of fun--to draw out the building myself, and to create some 2-dimensional scale models of the boats that will be inside (at least for the foreseeable future). Using a downloaded JPEG image of the Triton hull profile and deck plan, I made some modifications in Photoshop--erasing the deck details from the overhead plan and the cutaway interior plan from the profile. This left me with basic line drawings, which I then cropped and resized to two different actual scales: 1/4" = 1' (large enough to be easy to work with, but small enough so that I could make some rough sketches of my building on regular 8-1/2" x 11" paper) and a larger, 3/8" = 1' scale, the largest size that would fit printed on a regular page. I printed out several copies of each size for later use. 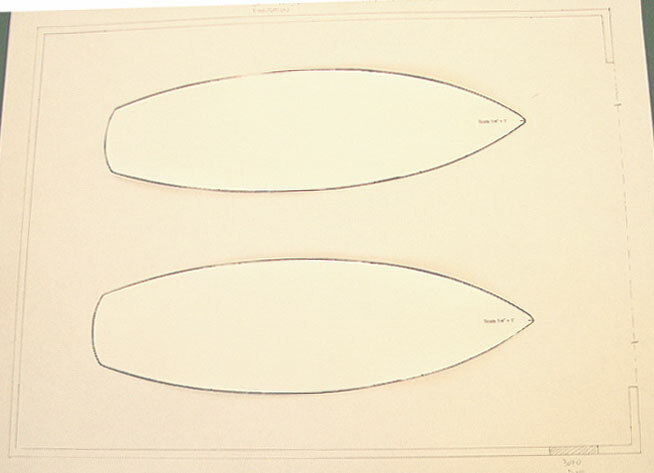 Beginning with the 1/4" scale, I cut out two deck plans and one hull profile for immediate use. On a regular piece of paper, I drew an overhead view of the 30' x 40' shed, including the profile for 6" thick wall studs, and laid the paper cutouts of the two boats inside. I was thrilled with how much room there was for both boats. Three Tritons could actually fit inside, side by side, with room to spare. With two boats inside, there's tons of room for work, as well as extra space for the proper juxtaposition of tools and benches. I could begin to imagine the space in my head. The large door opening shown is 22' in width; the smaller tick marks closer in towards center represent the 16' width of the door as spec'd in the steel building quotes. Next, I played around with the side profile of the boat inside the side shed view. One thing I was very interested in was building height. When spec'ing the building, I chose 20' as an arbitrary, conservative measurement. With the paper cutout of the boat inside, I could see that there was an opportunity to reduce the building height, especially accounting for a 3:12 or greater roof pitch, which would increase the center height beyond that of the walls (at least in a steel building...but a trussed roof would end up flat inside the building, with the ceiling parallel to the floor). What the cutout allowed me to visualize, and double check with a scale rule, was that 20' clear inside space was overabundant, and if reduction of height decreased the building cost (which of course it does), it would be OK to lower the sidewall height to 15', without compromising current--or future--uses. Even allowing 2' of blocking space beneath the keel (1' is more appropriate), there was room, in a 15' tall building, for a 6' person to stand upright on the highest point of the foredeck, sidedecks, or after deck. There was even 5' of headroom above the top of the cabin trunk; lowering the blocking to a more appropriate 1' in height, the headroom increases correspondingly. In the photo of the side view, the 15' height is represented by the dotted line, while the solid line higher up is the original 20' height. You can see that I got a bit carried away and colored the profile to match Glissando. Well, sort of. Silly me. I think the reduced height might be good. The building will look less ungainly, and will cost less. It's unlikely that I will ever have a boat inside that would run into practical clearance problems with this roof. Boats of deep enough draft to cause a problem here would be too big for me, and of no interest anyway. I feel so luck to even be considering putting up a building that I don't mind some compromises that, for all practical purposes, won't end up being compromises anyway. Another option, one that would allow the sidewalls to be even further reduced with little reduction in overall clear space inside, is a gambrel structure with a steel or wooden roof truss system to eliminate the need for columns of collar ties. This bears further investigation. During the first week of February, I visited a friend's boat barn that he had built several years earlier. I wanted to see one person's execution of this admitted indulgence, and get some ideas for construction and design. His barn was very attractive and extremely functional, and I felt very envious while inside. See some photos of this attractive boat barn here. All in all, it's hardly a basic process Watching the tapes really turned me off and helped me realize that erection of one of these things was going to be costly, and time consuming. I had originally thought I'd just hire an erection crew, but it was pretty apparent that that would have ended up being a significant cost as well. Although the upfront costs for the initial purchase of some steel buildings seems low when originally quoted, there are many factors not taken into account that would raise the cost significantly by time of completion. Again, the main advantage of steel is that they are designed for clear interior spans. Well, the larger the building, the more important this basic strength of steel is. However, for a relatively small building like mine, a 30' clear span can be achieved with roof trusses, or with some engineered lumber products--or even some steel reinforcing beams. Since I don't care about a big loft under the roof, engineered trusses are probably the best route to gain the clear span I want. I have roof trusses in my current garage for a 24' clear span. Besides, a wooden building offers more interesting design possibilities, which, all things considered, I would prefer anyway. With my own labor, most interesting design elements don't end up costing more, beyond whatever minor materials cost there is. I'm pretty resourceful at working alone, and I'm sure I could scrape together some helpers now and then if I needed some help muscling around large wall sections or something. 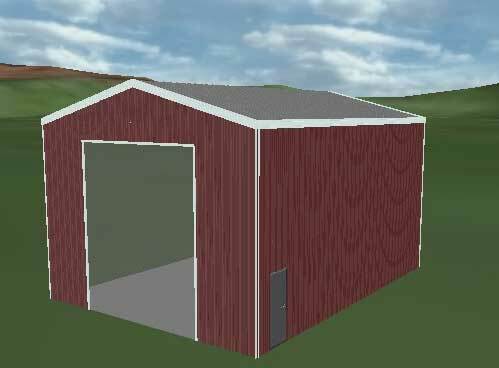 I found some interesting gambrel barn plans online at www.barnplans.com. I liked them. However, the high trussed gambrel really offers more room up high than I have any need for, and these particular designs required a loft over at least half the length of the building in order to properly support the walls and resist the natural tendency of the trusses to spread the walls. The loft is all well and good, and would be nice to have, in a way. However, in order to get the clear space I need beneath the loft, the whole barn would start getting really tall, and just too big. I discarded this thought, especially after Mike Hass's kind offer. With my basic ideas and needs, and his design expertise, we worked via email and fax for a few weeks to come up with an attractive barn plan that would work for me. Designed much more in keeping with a scenic Downeast Maine location, the barn incorporates all the features I desired, and more. At this time, I have only some rough conceptual sketches (see below), but will post some more information once the design is finalized. Then, all that will remain is quoting out the materials to build the thing, and hoping for the best. If all goes according to plan, construction will occur over the summer. Click here to see the 2nd generation concept sketches. After some weeks of hemming and hawing and pro-and-conning and thinking and worrying and generally tearing myself apart over whether or not to actually commit to building the barn, I made some real progress. I received a quote from a builder who has done much work for other members of my family over the years, and the quote, while (of course) higher than I had hoped for, was within the realm of possibility. A couple weeks later, after worrying more about the quote and, more importantly, about the proposed location for the barn, I made an appointment with a local excavator to come out and look things over, and give me a quote for the site work needed (slab site preparation and a new roadbed). There were some access issues with the original site where I had hoped to locate the building, so I chose a new location on the opposite side of the yard, where road access would be a straight shot and the barn would still be well out of the way and as unobtrusive as possible. Not that it will be unattractive--far from it, I hope--but it still needed to be something that didn't dominate the back yard. I received my site quote. I guess we're going forward with construction. It's all going to cost more than I really want, but what are you going to do.